Yesterday I took part in the inaugural London to Hastings bike ride in aid of the British Heart Foundation. The preparation for the ride started badly on Saturday when I damaged the rear inner-tube whilst checking tyre pressures. I pumped up the rear tyre but couldn't get the pump off and pulled too hard on the stem which tore the tube where it meets the stem. The tyre deflated instantly and I had to replace the tube. Later that day I got a call from my friend to say that his bike had a puncture and he didn't have a spare tube. I didn't have a presta valve one for him and the shops had shut so we decided to see if we could get it done at the start. At 4.30 my alarm went off and I got up and got the bike and my bag into the car. Just after 5am my friend, Richard, and ride partner for the day arrived at my house and we drove to my brothers house where he would give us a lift with our bikes to Crystal Palace. We arrived at the start in plenty of time, an hour before we could start. We found a bike mechanic and my friend got a new inner tube fitted. Shortly after, Les (the moon walking bear) turned up. We chatted for a bit before starting the ride at 8.01am. The ride got off to a good start. The weather was dry but a bit cold. The roads were quiet and the terrain was easy. The gentle ascents and smooth, short down hill sections were fast in London but as soon as we were out of London, the hills came thick and fast. My friend was struggling to keep pace with me on his mountain bike on both the up the hills and down. Many times I either waited at the top of the hills or slowed down to let him catch up. We got separated for a bit when I told him to carry on without me as I stretched my tightening hamstring. We both missed the first refreshment stop and met up again half way between the next stop. We then came across a sign that said 50 miles to go - that was after 20 miles. That can't be right? The ride is 61 miles, not 70. We made it to the second rest stop which happened to be after a killer of a hill. My friend was in agony. His muscles were tight and hurting and he thought he might not be able to continue. I gave him tips on stretching, riding style and nutrition. After about 15 minutes we continued and he stopped at the next shop for some snacks. He suggested that rather than me constantly slowing down for him, that I continue riding at my pace and we meet up at each rest stop. This worked well as I could push on but the hills were killing me. The hills were relentless. After every ascent I either stopped on the short flats to recover where necessary or recovered on the descents. Most of the descents were over so quickly and this got worse the further into the ride we went. At the third official stop (the second we found) we still didn't know if the ride was now 70 miles and not 61, even though the signs seemed to suggest it. My friend was doing better than expected arriving only 10-15 minutes after me. After more killer hills we hit the most killer hill of all. 800 ft of climbing over 2 miles! The next rest stop came shortly after and it was well needed. 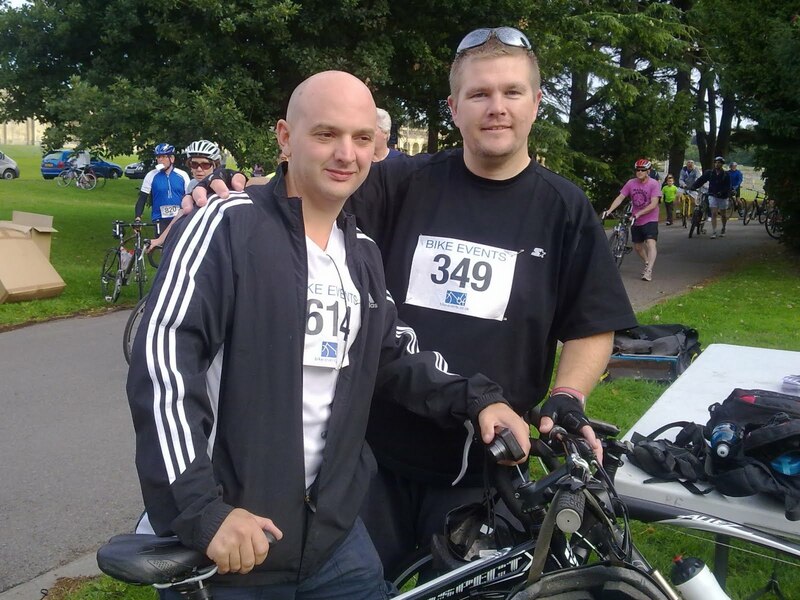 It was at this stage, 55 miles in that we realised the ride was definitely 70 miles in total. The route had been altered due to road works. 9 extra miles of serious hills was taking the piss! The last 15 miles were the hardest. Every steep hill was followed by a steep but short ascent. The countdown mile markers started to appear and I was hurting. As the ride had gone on my hamstring was hurting up the steep hills and the muscles in my shoulders and neck were really tight and painful. 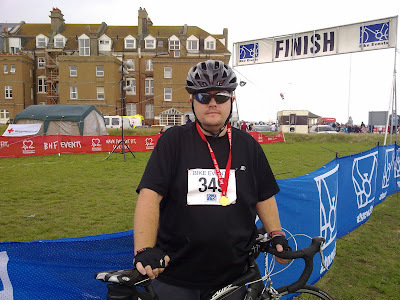 With the finish being at the seafront in Hastings, the last mile was totally flat and I rode as fast as possible I couldn't wait to finish. People were clapping as I approached the finish and my wife and two kids were there to meet me. I crossed the finish line just before it started to rain. My friend crossed the line 5 minutes later. We were both in agony vowing never to do this ride again! 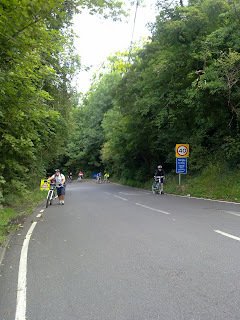 It made the London to Brighton seem like a leisurely afternoon ride. Have you compared you (in today's photo) to you in your profile picture!! You could have smiled for your bloody photo! John - It's a big difference to what I was 6 months ago. I've updated the blogroll now. Joby - It was starting to rain and the wife couldn't use the camera on the phone. I probably did smile moment before she actually took the picture. 6,289ft! That is crazy, and kinda nice to know this number as an achievement. It was a real tough route, but I found it rewarding. They had a 70 mile marker at the start when I turned up at 9:30, this was the first train from Hastings into the event! Here is my account of the day just to share..
Well done Toby must say that sounds a killer extra 9 miles :-( just for good measure. Ope the hamstring shoulder and neck is better today mate. Well done. I did it too.....my bike is in the sea now!! I think we've all been there with the inner tubes / valve. It normally happens to me when i'm rushing to mend a punture by the side of the road before I freeze to death. Is the full route mapped out anywhere online? Thanks for all your comments guys. I've added the route detail to the blog post so people can see the hills. also did this on Sunday, wow , what a course! Glad I didn't walk up any of the hills, but 10 miles from the finish I seriously thought about it. Enjoyed the challange but I could see alot of people weren't prepared for this type of course. I will be doing the event in 2011 too. I'm sure it's possible to do a sub 4 hour time but I don't think I could manage it. and from what i`ve read about last years riders congratulations mate. not sure what ive let myself in for. I'm lighter fitter and stronger than I was last year and have many months to improve more but it will still be tough! Good luck Gary. i am coming over from australia to do this ride and hill train all the time having ridden up hills that are 20% can anyone tell me if there is a 25% hill in this ride? I'm pretty sure there was a 25% but it was a fairly short one and early on. I cycle the roads in the early 1/4 of this ride regulary. There is a 25% hill on Downe Road/Cudham Hill. As Toby Field said it is short, maybe 150-200m at most. The problem is that there's a junction with a busier road at the top, it has poor visibility to the left. If you're wearing cleats then be ready to release them near the top. Probably safer to dismount and cross the road, you'll have ridden the hill so no shame in being careful and getting off the bike. Enjoy! Correction, I meant Downe Road/Church Hill. The tricky junction is between Church Hill and Cudham Lane.